So now you have planned a trip, figured your team mates..
1. A spare tube : For that rare occasion when u cant find a puncture guy, you need your spare tube that sint punctured yet. 2. A footpump: The absolute essential tool in the bike tourer’s kit, I dont need to tell you why. 1. The tyre and tube: Look for tread wear. A good grip on the road is absolutely essential if you are going to face wet weather or unpredictable terrain. A well gripping tyre can save your life from falling off a cliff etc. Or getting s few stitches when you least expect it or need it . So check replace and run it for at least 100 km. Same with tubes. Fresh tubes have lesser chance of puncture, or like some unlucky souls, can develop a puncture right when u installed it. 2. The Secondary Chain and Sprocket Assembly : Check for wear and tear on the sprocket. If you find cut teeth, time to replace. Same with the chain. If the chain tightener has reached the end of its active life. Do NOT cut the chain. Always replace. Always. The assembly should be replaced 15000 km ideally. And I thnk it is a smart thing to do as the investment is of about Rs 1000 or so. 4. Brake fluid in case of disc brakes. 1. How to remove the wheel assembly (front and rear) . Removing the brake assembly from the disc is tricky and extra care should be taken to make sure that you DO NOT press the disc brake lever while the disc is out. You are in for a very bad day then. Th disc pads will lock up and you wont be able to pull them apart to replace the tyre. Draining brake fluid etc can also drain your energy.. so just don’t do it! 5. How to operate a footpump.. Duh! How to replace all of the above. Not too tough, in fact fun to do. Much needed in case of a cable snap. Does not happen a lot on the japs, but for an RE, the clutch cable can snap anytime, anywhere .. no telling. So learn! And the 5 speeds have a completely different way of locking the cable. 1. 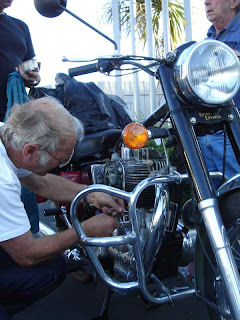 Your spark plug – For End of life signs ..
2. Battery – If it is reaching the end of its life, replace it, do not doubt. 4. Check/Replace the Air and oil filters. Your bikes performance depends on how well the lubrication and breathing system works. And that my friends, kind of covers most things. I know that this almost sounds like a bike overhaul list. (which it kinda is) but for the serious tourer, knowing what to do and when can make all the difference between being the one who made it in time and being the one who just could not. So be prepared like a mad man. A great performing bike is all you need on any long trip you undertake. Keep your steed in top condition, and the rest the machine will take care of. And if anything that should not happen, happens.. you will be better off dealing with it, when you have the equipment and knowledge to deal with it.